October 2018 slides in with the promise of more and more heat. It’s supposed to mean cooler weather and shorter days, but 91 degrees is NOT cooler. (sigh) What happened? The leaves on the poplar trees are fading into a lemon-yellow and the dogwoods stand ready to disrobe in a puddle of color. Bright red berries will soon be gone and there are “muskydine” vines ripe with wild grapes. I only got a few flowers from my Moon Vine. 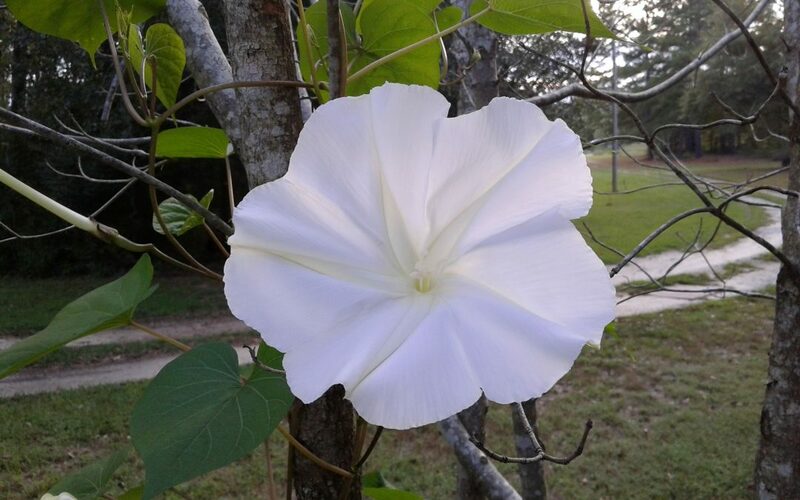 I planted seeds and this one vine has managed to produce about five LARGE white flowers. Apple picking, hay rides, pumpkins and a Fall Festival at church; these are a few of the things that sing of Autumn. This year picks up steam and will soon disappear in a blaze of glory. While I won’t miss the sweltering heat; neither do I look forward to scraping ice off the windshield. I will say, it won’t be long before my tush gets to enjoy some heated leather seats. Too bad the seats couldn’t be cooled as well. The lawnmower can soon be retired and there’s a pile of mulch to be spread around. It’s time to pull up the pepper plants and re-purpose the pots. I’ve given some serious consideration to growing some mustard greens. With these huge containers on the deck, picking will be much easier. It’s been on my mind for years to grow some pansies. They love cold weather and this just might be the year to enjoy their colorful little smiling faces. It’s also time to plant bulbs for next year. Daffodils in the Spring come from a plan the year before. There’s a lavender azalea that’s doing well in its new location. It was the result of an experiment. I wrapped a small branch on the parent plant with some peat moss and plastic wrap and tied it all in place with yarn. Over the summer, that branch produced roots and allowed me to propagate another bush. It spent one or two seasons in a large pot being pampered until I moved it into the yard. 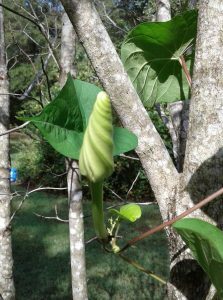 I’m looking forward to seeing it bloom next year. The Granddaddy Graybeard was transplanted and yet it has not bloomed. I know the male plant blooms every other year while the female blooms every year. Well, if this rascal refuses to bloom, it can not-bloom somewhere else. I won’t keep babysitting a green twig. (bummer) This plant is also called a Fringe Tree. It blooms in the Spring and looks like hair. Rather fine tendrils that are almost white and it smells a lot like honeysuckle. My grandfather taught me how to dig and move these and I will always remember my Papa Dorn when the Graybeard shows off. Until next time, I think I need a cold glass of sweet tea. Lord, where is the cool weather? The Moon Vine opens at night from a bud that looks like a swirl of ice-cream. Thanks for the feedback, Jeannie. I was beginning to think it wasn’t working. I’m getting positive remarks in person, but those don’t let me know the site is doing what it should. Blessings to you!